Returning for a strictly limited season, The National Theatre production of The Curious Incident of the Dog in the Night-Time makes its way to the Piccadilly Theatre. Adapted by Simon Stephens from the 2003 novel by Mark Haddon, grow your own curiosities as you enter the mind of Christopher Boone, a teenager whose love of facts and forensics sees him becoming his own detective. Featuring intricate staging and unforgettable lighting courtesy of director Marianne Elliott, the production has now been seen by more than three million people worldwide from Seoul to Seattle. It doesn’t take a detective to work out this is a show worth seeing! 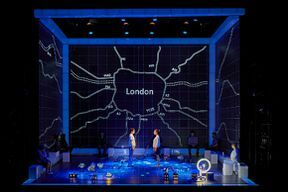 Book your tickets now for what is set to be an unmissable return of The Curious Incident of the Dog in the Night-Time to the West End. Please note: This production contains strobe lighting, smoke effects, high intensity video & light effects, and loud sound effects. There is some strong language in this production, as there is in the novel. This occurs at the very beginning of the show and infrequently at other points during the show. Suitable for 11yrs+. Casting for the return of The Curious Incident of the Dog in the Night-Time includes Emma Beattie, Lynette Clarke, Eliza Collings, Kieran Garland, Emma-Jane Goodwin, Julie Hale, Lucas Hare, Joshua Jenkins, Gemma Knight Jones, Stuart Laing, Sean McKenzie, Sam Newton, Joe Rising, Rose Riley and Craig Stein. Valid Mon- Wed Evenings until 27 Apr 2019. 15-year-old Christopher Boone discovers his neighbour’s dog has died. Immediately arousing suspicion from the police that he is in fact the murderer, Christopher becomes fascinated with the case and decides to investigate the death. Recording his experiences and meeting new people, his detective work leads him to finding out information Christopher would have never thought possible. Using facts, figures and his love of mathematics, Christopher’s inquisitive mind grows larger. Overwhelmed by information and stepping out of his normal surroundings, will he step out of his structured days and solve the curious incident? 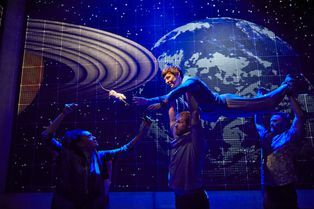 LOOKING FOR CHEAP THE CURIOUS INCIDENT OF THE DOG IN THE NIGHT-TIME TICKETS AT THE PICCADILLY THEATRE? With a huge range of cheap tickets, London shows have never been better value. 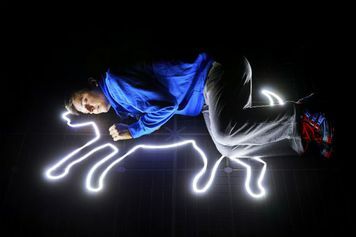 Book with us for The Curious Incident of the Dog in the Night-Time and enjoy great entertainment that a price in tune with your budget. You can book from 24-Apr-2019 to 27-Apr-2019. Where is The Curious Incident of the Dog in the Night-Time? (2mins) Pass the famous illuminated signs on your right to take Glasshouse Street/Sherwood Street where the theatre can be seen.